Official logo of Wikipedia. Source: Wikipedia Commons. This logo is copyrighted to Wikipedia Foundation. In the course ‘Methodology for Urbanism’ we discuss why Wikipedia cannot be considered a reliable academic source. This is because Wikipedia is not “peer reviewed”. Peer reviewing means that to be accepted as authoritative, a text must be reviewed by a team of recognized specialists in that specific field of studies. Wikipedia is indeed “peer reviewed” but the problem here is that the people contributing to Wikipedia are not backed by any scientific institution that guaranties their credentials (even though some of them are true authorities in their fields). This generates all kinds of uncertainties. But does this mean that we should avoid Wikipedia at all costs? Not at all. Wikipedia is great to find FACTUAL INFORMATION that can be quickly TRIANGULATED. The kinds of verification and review mechanisms put in place by the Wikipedia Foundation are generally effective (but not always) and also generally result in reliable information (but again, not always). The primary questions answered with factual information are WHAT?, WHERE?, HOW MANY? and WHO? (but again, this is disputable, as even these questions may result in different answers according to different sources and world views). WIKIPEDIA cannot be used to gather ANALYTICAL INFORMATION, in which someone “analyses and interprets facts to form an opinion or come to a conclusion. The primary questions answered with analytical information are WHY? or HOW?”, according to the ODU Library Services Website. WIKIPEDIA is a tremendous SOCIAL EXPERIENCE, where thousands of people contribute to a collective description and understanding of different issues. Besides, the comprehensiveness of the information contained in Wikipedia is impressive. The reality is, students make use of Wikipedia all the time. However, we want to encourage you to go beyond Wikipedia and use other more authoritative sources. If you want to be scientific, you must then go further and TRIANGULATE your information. You also need to look for data in authoritative sources, which have been checked by people working in recognized education or research institutions. A good place to start is GOOGLE SCHOLAR. It will lead you to scientific papers published by responsible editors. You should also look into TU DELFT INSTITUTIONAL REPOSITORY of thesis and reports. And of course, you should look into the collection of SCIENTIFIC JOURNALS at the TU DELFT LIBRARY. These are BY FAR the best sources of reliable, relevant analytical information! Now read an article published by the Technology section of the BBC yo understand some of the problems Wikipedia faces. Wikipedia editors have expressed “shock and dismay” at the discovery of hundreds of user accounts set up to make paid-for entries. Paid-for advocacy and the adoption of fake “sockpuppet” identities for promotional purposes are against the free web encyclopaedia’s policies. Sue Gardner, executive editor of the Wikimedia Foundation, said “as many as several hundred” accounts were suspect. Editors have blocked or banned more than 250 accounts, she added. ‘Promotional tone’The editors say promotional entries – which were posted by an account called “Morning227” as well as by others – have been commissioned by Silicon Valley dot-coms, small financial institutions, authors, medical doctors, a musician and an oil company, amongst others. Citations are taken from a number of blog-like websites that accept “citizen journalist” material, including CrunchBase, DigitalJournal.com and Technorati.com. Entries “often have a promotional tone and always contain material that is either neutral or that is flattering of their subjects, never material that is critical or negative,” Wikipedia said. However, Wiki-PR disputed the idea it had broken Wikipedia’s rules by promoting or advertising its clients’ agendas, saying it merely wanted to ensure they were “presented accurately” on the site. “The PR in Wiki-PR is a misnomer – we’re a research and writing firm,” Jordan French, the firm’s chief executive, told the BBC. “We research the subject and write in an accurate and properly referenced way about it, filling a hole at Wikipedia for many subjects – concepts, companies, people, even astronomy – in which other editors lack an interest. More insights on how WIKIPEDIA works HERE. One of the pillars of the course Methodology for Urbanism (TU Delft) is the study of the complementarity between TEXT and IMAGE. We believe that designs and plans are made not only of drawings, maps and photographs; they are also made of STORIES or NARRATIVES. In fact, a design IS a narrative of how something should or ought to work in practice. This narrative is composed by IMAGES (drawings, photographs, maps, films) and TEXT (reports, written explanations, captions, map keys but also oral presentations and explanations). Whenever you design or plan, you use images and words to explain your ideas. The idea that “images speak for themselves” is a fallacy: images and words are complementary and help us convey information in a much more meaningful way. Words can deliver information that images have a hard time conveying. Likewise, images might contain information impossible to convey otherwise. But there should be no primacy of one over the other in design and planning studies: they are complementary to each other and help us convey complex messages about actions and spatial interventions. The complementarity between TEXT and IMAGE is one of the EIGHT CRITERIA put forward by BIGGS and BUCHLER (2008) to qualify the relationship between design practice disciplines and academic research. Their hypothesis is that it is very difficult to understand and evaluate research in practice-based disciplines (like Urbanism) because they cannot be evaluated according to traditional academic criteria. Therefore, we need a special set of criteria to understand and evaluate research in the practice-based disciplines. They divide these criteria in two groups: the NECESSARY criteria for ANY academic research (both practice-based and traditional research) and the four additional criteria for practice based disciplines. The four NECESSARY criteria for any valid academic research are: QUESTIONS AND ANSWERS, KNOWLEDGE (a theoretical framework), METHODS and AUDIENCE (We explore each of these criteria in different exercises). The FOUR ADDITIONAL CRITERIA for practice-based research are: ROLE OF TEXT AND IMAGE, RELATIONSHIP OF FORM AND CONTENT, FUNCTION OF RHETORIC, and FUNCTION OF EXPERIENCE. (Again, we explain and explore these criteria in different exercises, but you can read the whole paper by BIGGS and BUCHLER HERE). The traditional TU DELFT presentation: At TU Delft, individual presentations last typically 20-30 minutes. Students must tell an audience of specialists (teachers and colleagues) the whole content of their research and design, with the aid of PowerPoint presentations, models and posters. In this mode of story telling, students must display abundant knowledge on the theme they have chosen. They also need to present an engaging story that will entice their audience and make them interested in the project. The audience must understand WHY that project is worth doing and what is the student’s contribution to the current debate on that theme. They can SEE the designs and be enticed by them, but they also need to understand why those designs are relevant. Students must PROBLEMATIZE the issue they are tackling. To ‘problematize’ means to point out what are the issues or challenges that must be addressed. Without a problem, the audience is likely to think, “why am I hearing to this”? The Cocktail Chat: In the cocktail chat, you meet someone at a party, and they want to know what are you doing at the moment. You are very enthusiastic about your project, and you want the person to understand what it is all about. However, you don’t want to bore that person to death, so you must keep the level of language to a conversational level (avoid jargon and technical terms. Keep the explanation simple) and the length of the explanation should be under 10 or 5 minutes. However, you also need to explain the context, problematize (What is the issue? Why is this an issue worth tackling?) and your ideas about how to come to good results. All this with a drink in your hands and a smile on your face! The Elevator Version: In the elevator version, you must tell the content of your research and design project to a very important person whom you want to guide your project, in just less than TWO MINUTES. The listener is in a hurry, so you must highlight the core theme of your research and design project and WHY IT IS WORTH DOING. Why is it relevant? And why is your approach original? Obviously, the structure of the account must be very economic, so the context, the issue and the approach must be explained very shortly. Yet, the account must be compelling enough to attract that person’s interest. Obviously, the way you speak and your body language are also very important (just like they are in the other versions). The Grandmother’s version: Without willing to sound patronizing towards grandmothers (we are sure there are nuclear physicists who are grandmothers), most of our grandmothers have not had technical training and are not familiar with issues of urban planning and design. Yet, they are citizens and have the right to understand our ideas about urban development. We use the figure of grandmothers to represent all non-experts, common citizens who need to understand our ideas just as our teachers do. In this style of story telling, the level of the language must be controlled to convey ideas clearly and simply, but without patronizing the listener. The complexity of the issue must also be explained, but in a way that makes sense to the listener. If you are tackling an issue of urbanization that is perceived by others as a problem, you probably will be able to explain it in terms that are understandable by all. We emphasize, however, the need to respect each individual’s knowledge and to use that knowledge to add to the explanation. All the same elements described in the previous versions must be there, but here your personal empathy, body language and delivery (the way you deliver a speech) are primordial. In PAIRS and STANDING UP IN FRONT OF EACH OTHER, students need to tell one another the core of their projects in just ONE MINUTE. This is the “elevator version” (a very summarized version of their research and design project). This must repeated at least 6 to 8 times, with different partners, and time must be kept. By doing this, we expect students will realize it is possible to tell a good story in a very short time, but in order to do so they need to choose what elements are essential. The narrative, though compact, needs to be structured, engaging and ought to contain a location, a perceived “problem” or an issue and they ways they are using to tackle that problem. Speed dating your design, a set on Flickr. 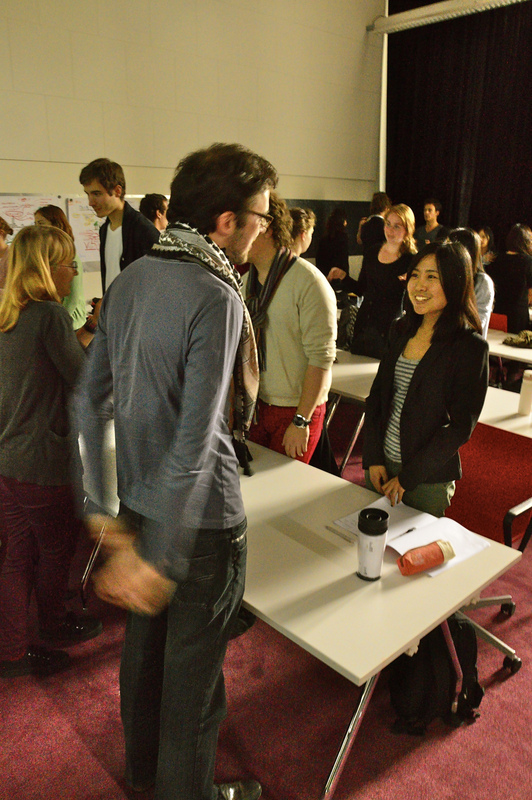 This is an exercise we conduct with MSc1 students at the Department of Urbanism of the TU Delft. The idea is to make them aware of the necessity to structure the narratives that accompany their research and design projects. In pairs, students need to tell one another the core of their projects in just ONE MINUTE. This is called the “elevator version” (a very summarized version of their research and design project). By doing this, we expect students will realise it is possible to tell a good story in a very short time, but in order to do so they need to choose what elements are essential. The narrative, though compact, needs to be structured and ought to contain a location, a perceived “problem” or an issue and they ways they are using to tackle that problem. MindMaps Urbanism 2014, a set on Flickr. These are MindMaps produced by students of the Master in Urbanism of the Delft University of Technology (TU Delft). Mind maps are visual tools for brainstorming and unfolding of concepts. The idea is that visualisation of how concepts unfold can help us understand these concepts better. Students were asked to unfold five key aspects of Urbanism: tools, skills, knowledge, values and qualities. This is an exercise where we remind students what logics of enquiry are (see posts below) and invite the to locate Urbanism as a discipline in a triangle representing hypothetical logics of enquiry. They then need to locate Urbanism as it is taught at TU Delft. Finally, they need to locate themselves (to which logic enquiry they identify the most). Subsequently, they need to imagine relevant questions and methods connected to their course at TU Delft and to different logics of enquiry.